Did you know that about half of Americans over the age of 30 have advanced gum disease? Gum disease is caused by untreated plaque and tartar buildup on your teeth. The bacteria in dental plaque are enough to irritate your gums and cause them to bleed more easily. While gum disease can be cured in its early stages by good oral hygiene and professional teeth cleanings, the same can’t be said of periodontitis (the advanced form of gum disease). Periodontitis deteriorates the bone structure supporting your teeth and causes your gums to recede, putting you at higher risk for tooth loss. In this blog post, our Gahanna dentist at Pure Dental will go over how your dentist can slow the progression of periodontal disease so you can regain good oral health. For more information on periodontal treatment, we recommend scheduling an appointment with your Gahanna family dentist. The best way to treat gum disease is to catch it in its early stages. Unfortunately, many people are unaware they have gum disease until the next time they see their dentist. Dental checkups are so important because they give your dentist the chance to diagnose gum disease before it develops into periodontitis. Keep in mind that some people may be asymptomatic, meaning that they show no symptoms of gum disease until it’s too late. One of the main causes of gum disease is not following a healthy oral hygiene routine. If you have recently been diagnosed with periodontal disease, you’ll need to make sure you brush your teeth twice a day, floss once daily, and use mouth rinse. The best way to slow down the progression of periodontal disease is to remove dental plaque from the surface of your teeth and gums. You’ll also want to make sure you see your dentist every six months for a dental exam and teeth cleaning. Depending on the severity of your case, your dentist may find it necessary to schedule dental appointments more frequently. If you have periodontitis, you’ll notice your gums starting to pull away from your teeth. Receding gums deepen the pockets around your teeth and get filled with dental plaque. Thankfully, your dentist can remove dental plaque above and below the gum line through a procedure called scaling and root planing. During this procedure, your dentist will also smooth out tooth roots so gums have a better chance of reattaching to teeth. As a last resort, your dentist may recommend a surgical procedure to slow down the harmful effects of periodontal disease. Surgical procedures used to treat periodontitis include gum grafts, bone grafts, and pocket reductions. It may be necessary to see a specialist who is experienced in how to surgically treat advanced gum disease. Dr. 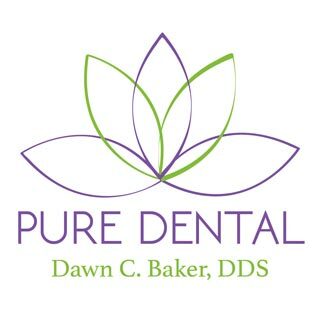 Dawn Baker DDS at Pure Dental is dedicated to helping patients regain good oral health after being diagnosed with gum disease. If you would like to schedule a teeth cleaning or dental exam, give our Gahanna dentist office a call at (614) 475-7580.